Home- Six Sigma Training- Lean Six Sigma - What is it? Lean Six Sigma - What is it? It stands to reason that if we don’t know about the existence of a problem, we cannot actively do something about fixing it. Six Sigma is a problem-solving methodology, but can only be used to tackle the problems that we know about. Lean Six Sigma seeks to help uncover the problems that we don’t yet know about, so that we can use the Six Sigma tools to determine their root cause and nullify them. By eradicating wasteful processes, you can not only improve the efficiency of your business, but also save money and ensure your team are always fully optimised for the task in hand. Each time a product is moved from one place to another it stands the risk of being damaged, lost, delayed, etc. Actual product - be it in the form of raw materials, work-in-progress, or finished goods - represents capital that has yet to generate income either by the producer or for the consumer. If you hold stock in the form of goods with any degree of working on them then it is effectively wasted money. Referring to transportation within the work environment, motion means wasteful moving of product between different areas and processes. If you can keep Production to one area, then you remove wasteful movement. Whenever goods are not in transport or being processed, they are waiting. In traditional processes, a large part of an individual product's life is spent waiting to be worked on and that is wasted time. Over-processing occurs any time more work is done on a piece other than what is required by the customer. It is the addition of extra parts or functions that the customer may not actually wan that becomes a wasteful exercise. Over-production occurs when more product is produced than is required at that time by your customers. You have to hold that stock and that is money that is not in the bank. When it’s made wrong, it takes time and money to put right and that comes out of profits. Lean can be used to remove the causes of defects in the first place so that they don’t happen. If the defect isn’t found in the company, it may be seen by the customer and that hurts your reputation. So Why Use Lean Methods? The Lean methodology teaches you to use the least possible amounts of time, material, energy, capital, space, facilities, and personnel to make and deliver your product or service to you customers’ satisfaction. If you use more than the minimum you need, then it is simply waste that takes valuable resources out of your company. Therefore Lean is an important feature, but so is Six Sigma. If you put the two together, you have the possibility of creating a methodology that will not only track down problems to their root cause but also make any processes that you are considering in the problem solving phase efficient too. Six Sigma is about removing problems; Lean is about removing waste. Add the two together and you have a problem solving methodology that looks at your processes and removes the excess from them. All work shall be highly specified as to content, sequence, timing, and the intended outcome. Processes must have fully documented procedures. The pathway for every product and service must be simple and direct. There should be no excursions and movement must be kept to a minimum. The basic VSM above shows a simple process where material comes in from a supplier, is worked, checked and packed before being shipped off to a customer over an unspecified amount of time. 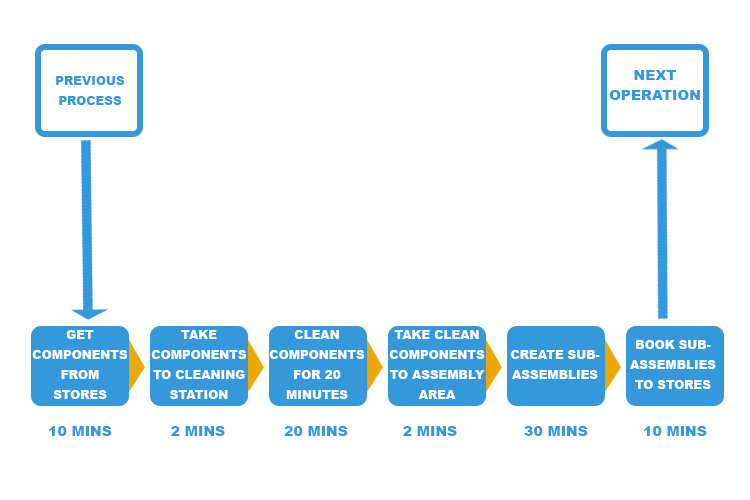 Unfortunately, this map doesn’t have sufficient detail to apply Lean to it effectively, but we could apply Lean principles if we consider a small part of the Production line and the interactions between the various stages of the process. Below is a theoretical sub-process involving the cleaning and sub-assembly of a series of components before they are put back in to stock under a different identifier, and to be used later on in Production. In this example, we have a series of operations that take place in different locations in the factory and take different amounts of time. At first glance it might seem reasonable but on closer inspection it can be seen that there is a lot of movement throughout. Components are being cleaned for 20 minutes, which could mean that the operator is effectively idle during the cleaning process or that the operator is taking ten minutes to book the sub-assemblies back into stores. Any process can be broken down into steps like this, and once it has, the inefficiencies soon become apparent. 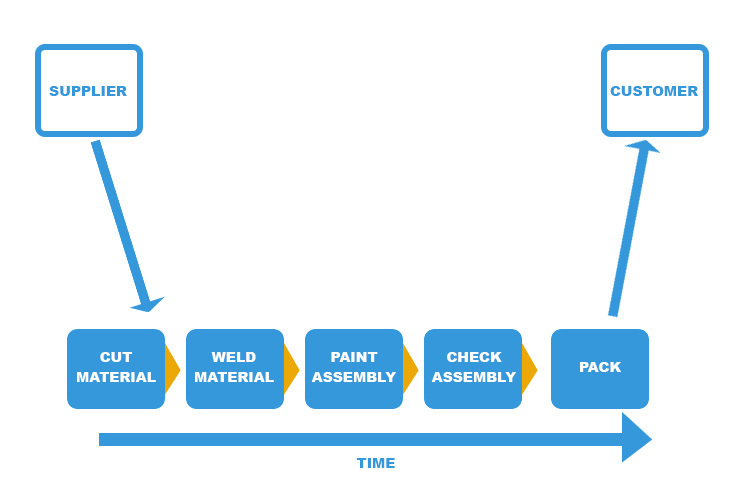 The process in Figure 2 could be made Lean by having the components cleaned and sealed in bags (step 2) by a subcontractor so that they can be removed from stores ready for assembly. Furthermore, the booking in (step 6) could be done by stores staff, leaving the assembly operator free to complete more assemblies. With these simple alterations, we can drastically reduce the time expended on taking components to be cleaned and booking in sub-assemblies. This results in the process being reduced from an hour and four minutes to just thirty-four minutes; a saving of thirty minutes! In addition, by removing two whole sub-processes, the possibilities of something going wrong are significantly reduced. The benefits of Lean are well documented, and will give almost any company tangible benefits and boosts to quality, customer satisfaction and profits. While it is geared towards a manufacturing environment, Service providers can also use many of the principles – especially Value Stream Mapping – to step through processes and identify potential problem areas. It is difficult to see what problems could exist with something like Lean Six Sigma, but there are some potential downsides to it. One of the major issues can be the cost of implementing changes identified by the Lean Six Sigma exercise. There may be cases where the cost of incorporating change doesn’t bring about a comparable financial bonus, but benefits are not just monetary and if customer satisfaction grows, then that is worthwhile in itself. Using the principles of Lean with the problem solving abilities of Six Sigma creates a powerful combination of tools that can highlight problem areas and then help streamline processes. Lean is only a small step away from Six Sigma and can employ many of the same tools to identify problem areas of the business, so you don’t have to invest in a whole raft of new training, but rather a small addition to that which your teams have already received. The message is quite simple; if you are thinking of investing in Six Sigma in your business, go the extra mile and ensure that you embrace the principles of Lean too so that your team not only find problems but will have an opportunity to streamline your business processes as well. If you want to streamline your business, we can match you with up to 4 leading UK Six Sigma suppliers. All you need to do is complete the form at the top of the page. Six Sigma - What is DMAIC?